A component of this project is to foster a lively and dynamic international community of practice that links artists, academics, students, and representatives of industry in an exploration of digital jacquard weaving. This has begun through establishing a network called the Weaving Data Research Group (WDRG) based at Concordia University, and will culminate in a symposium in 2018. 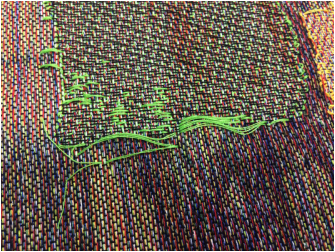 Meetings and workshops foster enquiry into digital culture and materiality, and explore the relationship between data and woven textiles. Through interdisciplinary dialogue, various social, cultural, physical, symbolic and theoretical questions will be explored internally and with invited guests. Research Assistants collect and analyze data sources, digital images and coded materials, compiling them into a visual database. Researchers identify and develop training opportunities to expand technical skills and provide opportunities to translate collected sources into woven forms. Broader participation in the project and its ideas are encouraged by inviting the public to contribute examples of digital data or ‘code gone wrong’. Research assistants translate and weave these examples, sending a finished piece to the submitter and collecting a duplicate into the Material Codes: Ephemeral Traces archive.